Note: This is a catalog of the Antique Tool Collection owned by Earl Varney that was held in Jewell, Kansas on September 22 and 23, 2008. Printed catalogs and Lists of Prices Realized are available from Don 'Bus' Haury - 7913 SW 24th, Halstead, KS, 67056 - 316-283-5876 or 316-284-7345 - Email donhaury@southwind.net. 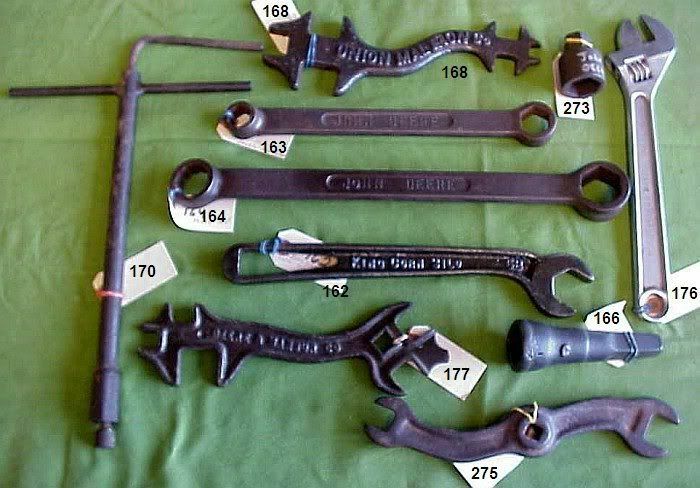 Visit the The Wrenching News Homepage for a list of other wrench auction catalogs and information on future wrench auctions and other events, information on collecting antique wrenches, and a discussion board. Auction will be held in the Community Center on the South side of the square in Jewell, Ks. NOTE: Earl has collected for over 40 years. This is one of the best collections in our area. Monday & Tuesday, September 22 & 23, 10:00 a.m. both days. See www.wrenchingnews.com for more information and pictures. Long time tool collector and Missouri Valley Wrench Club member Earl Varney of Jewell, Kansas has decided to disperse of his large and varied collection including antique wrenches, woodworking tools, and advertising items including an extensive Maytag collection of tins, bottles, etc. 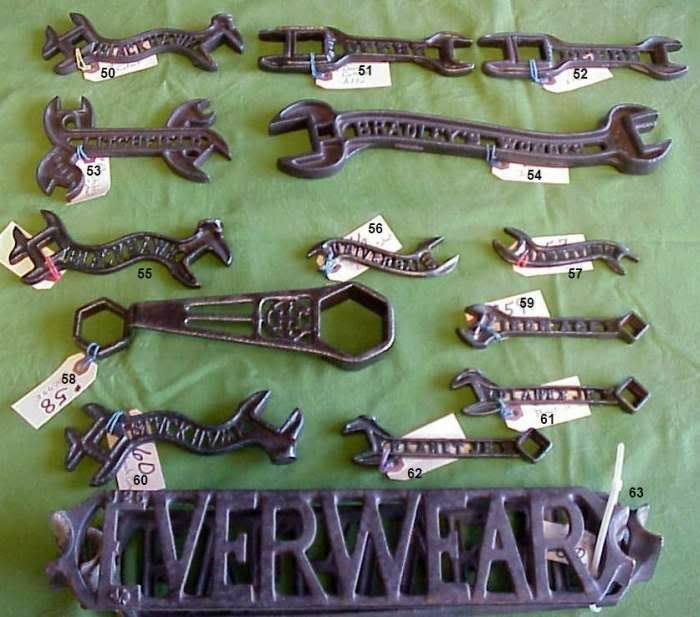 In addition to these numbered lots there are well over a thousand wrenches to he sold including several hundred John Deere, International Harvester and other farm type wrenches; a large assortment of automotive wrenches; numerous monkey wrenches and other adjustable wrenches and plier type wrenches. Brands include Winchester, KeenKutter, H. D. Smith Perfect Handle, Coes, Billings & Spencer, Bemis & call and many more. There were actually too many wrenches to sort in the time allowed so there are bound to be some rare wrenches that we didn't get listed. Note: To view individual or group pictures click on the logo in the listings. 001. Banner 2813B buggy wrench. 002. Pratt 2813C buggy wrench. 004. Freeport D buggy wrench. 005. 7307C (Eberhard) buggy wrench. 007. Moon Bros C buggy wrench. 008. 7307B (Eberhard) buggy wrench. 009. Zimmerman B buggy wrench. 010. Studebaker 1-1/8 buggy wrench. 012. H. A. Muckle St. Paul 310 buggy wrench. 015. Ideal B Apr 28, 1903 buggy wrench. 023. Quick adjust combination buggy wrench marked only 204 / 206. 037. Mathews Never Stall combination wrench tool. 040. 8 in Ellis Pat Appl. For Crescent type with adjustable head angle. Repaired. 042. Transatlantic Clock & W. Co Germany screw adj nut wrench & tool holder. 043. Sprigg's & Troyer's Bolt Wrench, Little River, Kansas brass and iron wagon wheel and carriage bolt holder. 044. 6.5” hatchet combination tool, plated like new. Germany. 045. Lownes April 23, 1889 reversible jaw pipe wrench 12”. 050. Blackhawk cutout with stud. 054. Bradley’s Wonder D99 cutout. 055. Blackhawk cutout with stud. 06. Edstrom quick adjust nut wrench 9”. 073. Perpetual Grip double alligator wrench with replaceable threading dies. 075. Crandall Expert adjustable angle wrench with three different jaws. 077. Billmont turn handle ratchet wrench with socket set in handle. 079. Combination pliers & alligator wrench (pitted) 7”. 080. Vise Grip Pat’d – first model Vise Grip without a locking lever . 082. Vise-Grip Pat Apr 8, 1924 – second model Vise-Grip. 083. 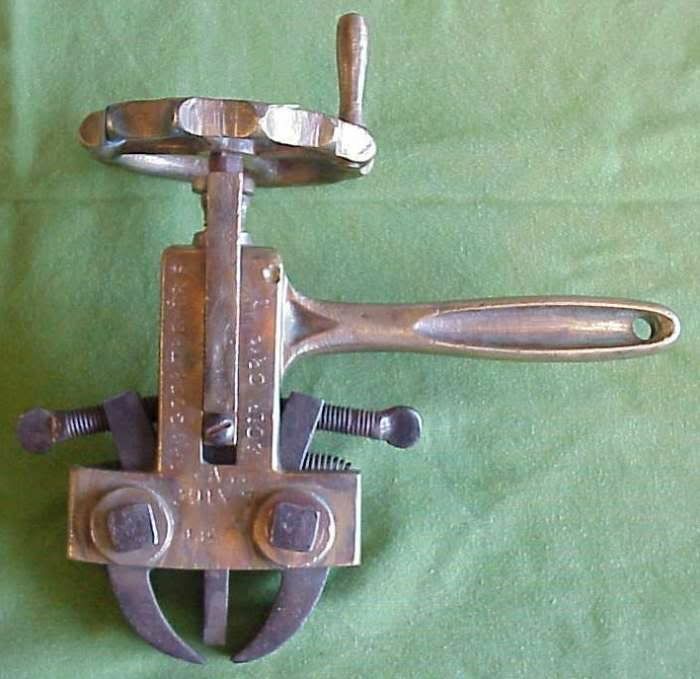 Vise-Grip No 10 pat. 1489458 older model with hex headed adjusting bole. New old stock with box and instructions. 084. Vise-Grip 75WR 75th Anniversary Limited Edition New Old Stock with original package. 086. Collison’s “S” Wrench Bruning , Neb. Locking pliers wrench. 090. Maytag (No. 3) 14987. 096. Maytag (No. 3) 14987 like new with original Maytag Engine Starting Instructions Tag. 097. Lot of 12 Maytag wrenches. Will be sold choice wrench. 098. Dempster Deering style wrench. 102. Star Drill 100 6”. 106. Haworth’s Check Rower 103 wrench with tack puller. 111. B. F. Avery & Sons J97. 114. Western Mfg. Co. 9.5”. 115. W. I. M. Co 1906 D70 11.5”. 119. Knight Soda Co. Chicago 6”. 121. 832A (David Bradley) wrench and spanner 13”. 122. Rock Island Plow Co. H358. 125. The Insurance KK.1753 (KeenKutter?). 127. 1818C (Case Steam Engine) 6”. 128. 1823C (largest of the Case Steam Engine wrenches) 24”. 129. 3329A Case tractor wrench. 132. TC 369 (Allis Chalmers). 134. 040272 tee handled socket (Allis Chalmers). 137. Shaw Wrench alligator April 26, 1910. 7”. 138. Shaw Wrench alligator April 26, 1910 9.5”. 139. Shapleigh Diamond edge adjustable alligator wrench. 140. KeenKutter adjustable alligator wrench. 141. H & H Co. Baltimore cast quick wedge adjust bicycle wrench 6”. 142. Unmarked odd quick wedge adjust bicycle wrench. Not listed RARE 4.75”. 144. Indian Motocycles flat steel double open end wrench 6”. 145. Indian Motocycles flat steel double open end wrench 6”. 146. Texaco Motor Oil flat steel 5.5”. 147. Mossberg 76 pocket wrench 6.5”. 148. Efficiency device self adjust wrench 6”. 149. Iver Johnson screw adjust bicycle wrench with tire tool end 6.5”. 150. Unmarked cast screw adjust pocket wrench (skeleton type) (Star) 4”. 151. Sterling cast bicycle? Wrench 5.5”. 152. Shaw Wrench alligator April 26, 1910. 7”. 153. Dudley Tool Co. spoke wrench May 29, 1894, 3”. 154. Unmarked spoke wrench 4”. 155. Pasco (cast spoke wrench) 5.75”. 156. Unmarked Baxter double ended nut wrench, 4”. 160. 21” unmarked Acme Twist Handled nut wrench. Jaw slightly sprung. 161. Set of seven Acme twist handled wrenches, sizes 5” to 18”. Sold choice wrench. 164. John Deere 12 point hex box ends. 15.75”. 166. “C” socket (Deere/Kemp-Burpee). 5”. 168. Union Mal Iron Co. (Deere/Union Malleable Iron Co) 10”. 169. John Deere 1340SC (pitted). 170. Unmarked tee handled double socket wrench (Deere/Letz E6075. 15”. 171. John Deere J1480H chain breaker tool. 175. John Deere TY3273 chrome pliers, 6.5”. 176. John Deere TY3220 12” Crescent type, chrome. 177. Deere & Mansur S51. 178. Van Brunt D380 (John Deere) with stud. 179. Van Brunt (John Deere) no stud. 187. 1692T (IHC) double socket 10”. 190. 6850H Water Pump, etc.(pitting). 191. 139-1/2 (IHC) tee socket wrench. 192. G246 (IHC) double open end socket. 193. G246 (IHC) double open end socket. 194. 22394VA (IHC logo) hubcap wrench. 198. M238 (IHC logo) single open end, 14”. 202. Lot of six shop made wrenches. 205. Ampco W1149A 16” monkey wrench. 206. “6” brass open end by hex wrench. 207. Odd all brass tee handled tool? 6”. 209. Craft roller type self adjust pipe wrench, 6”. 210. Craft roller type self adjust pipe wrench, 9”. 211. Craft roller type self adjust pipe wrench, 15”. 212. Bog Superior Quality oil pan, etc. bolt holder and speed wrench, 22”. 213. Odd screw adjust pipe wrench similar to Schulz 583, 14”, damaged. 214. Wright Oct. 3, 1893 lever and screw adjust pipe wrench, 16”. 215. Mossberg Wrench set No.14. in wooden case Mossberg largest set, missing only the pliers. 216. Mossberg Socket Set No. 10. in wooden case. 217. Koeth’s Kombinatrion Kit pliers set with six interchangeable jaws in wooden case. 218. Park Metelware multiple head wrench set in metal case. 219. Boe Mfg. Socket and ratchet set in metal case. 220. J. L. Taylor Pipe & Nut Wrench – 18” quick adjust rack type. 221. La Dow Wrench – M. D. F. Co. Marshalltown, IA, 18”. 222. Wright’s Pipe Wrench, odd screw adjust, some pitting, jaw chipped., 13”. 223. Odd combination pliers, screwdriver, nail puller marked “Pat Appl’d For”, 14”. 224. Hill’s Patent 1878 all metal screw adjust nut wrench, pitted, 9”. 225. Universal ratcheting Crescent type wrench, 8”. 226. Bullard No. 2 self adjust pipe wrench, 12”. 227. Steinadler No. 501 9” auto type wrench. 228. Unmarked different ratchet wrench, 9”. 229. 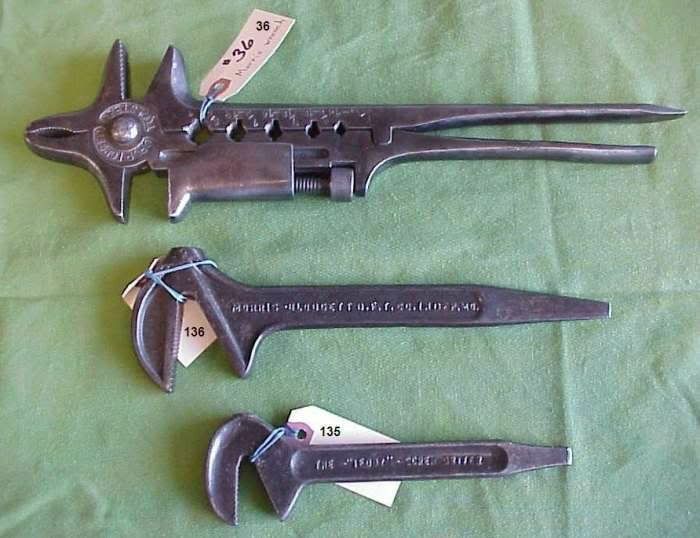 Pat Nov 20 1894 combination hammer, wrench, staple puller, and fencing tool, 10”. 230. Unmarked combination fencing tool with hammer, crimper, etc. 10”. 231. Scholler 6” & 8”. 232. Crescent 4” & 6”. 233. Crescent 6” & 8”. 234. Crescent 6” & 8”. 235. Crescent 6” & 8”. 236. Crescent 6” & 8”. 237. Crescent 6” & 8”. 240. Simmons KeenKutter 8” Crescent type wrench, like new. 241. Shapleigh KeenKutter 8” Crescent type wrench. 242. 6” Winchester wood handled monkey wrench. 243. 8” Winchester wood handled monkey wrench. 244. 10” Winchester wood handled monkey wrench. 245. 12” Winchester wood handled monkey wrench. 246. 15” Winchester wood handled monkey wrench. 247. 15” Winchester wood handled monkey wrench. 248. 21” Winchester wood handled monkey wrench, replaced handle. 249. Winchester wood handled monkey wrench. 250. 8” Winchester wood handled monkey wrench. 251. 10” Winchester all metal monkey wrench. 252. One gallon size “Winchester Hot And Cold Jug” with good decal. Note: Also see Lot 303 for a Winchester wrench store display board complete with 32 Winchester wrenches. 253. For Water Pump Nuts Only (Caterpillar) 13”. 254. S702 For Water Pump Nuts Only (Caterpillar) 10.5”. 257. Ohio Cultivator Co. / DA32, 16”. 259. Robinson Spreader A43, 10”. 260. Crosby steam engine tester gauge wrench, 5”. 261. Firmin L. Carswell Mfg. Co., 13’. 262. 1882 - Samson For Wrist Pins, etc. (Stover Windmill), 7.5”. 263. B319 (Moline) double crowfoot wrench with handle, 9.5”. 264. TC369 (Allis Chalmers), original orange paint, 10”. 265. TC369 (Allis Chalmers), original orange paint, 10”. 266. B748/B749 (Stoddard) check row pliers. 267. D189/D190 (Moline) check row pliers. 268. J89/J90 check row pliers. 269. 423/424 (Superior /American Seeding Co.) check row pliers. 271. Midland Mfg Co, Tarkio, MO – 2, 9”. 273. Unmarked John Deere socket for H tractor cylinder head bolt, 2” long. 274. A124 tee wrench (John Deere) 4.5”. 275. “A" (John Deere/Kemp-Burpee) doe wrench with center socket, 10”. 276. No. 244. Mossberg end wrench used on John Deere Waterloo Boy tractor. 277. No. 264. Mossberg end wrench used on John Deere Waterloo Boy tractor. 282. 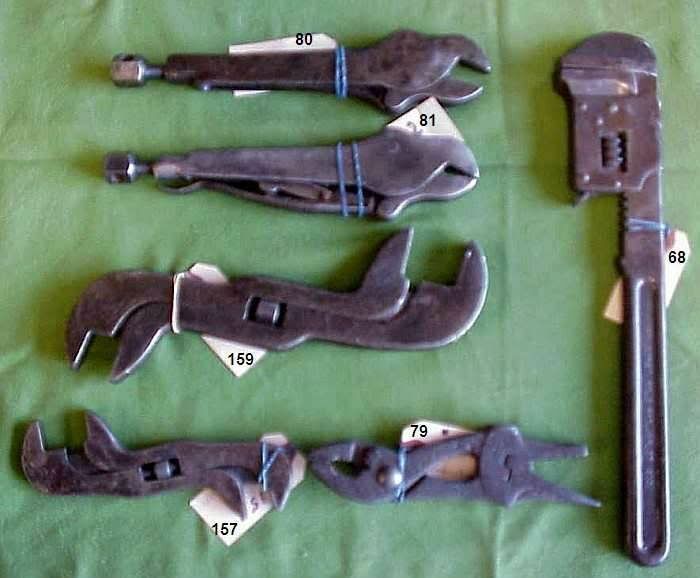 Lot of four Delco Light Plant Wrenches: three 90257 and one 95095. 283. Red Viking hatchet combination fencing tool. Like new with original finish and label, 11”. 285. No. 98 clevis and No. 86 pin/wrench. 286. No. 98 clevis and No. 86 pin/wrench. 287. Unmarked clevis and pin/wrench. 288. No. 181 clevis with a pin/wrench. 289. No. 6 clevis and pin/wrench (Eberhard logo). 290. No. 2835 clevis and No. 300 pin/wrench. (Moline Iron works logo). 291. No. 2836? clevis and No. 300 pin/wrench (Moline Iron Works logo?). 292. Lot of two unmarked clevis and pin/wrenches (pitted). 293. Clevis pin wrench marked "RAKE" - 9.5”. 294. No. 138? with a L in a circle clevis pin wrench. 296. Ranchman combination hatchet fencing tool. 297. 7” H. D. Smith Perfect Handle wood handled open end wrench. 298. 9” H. D. Smith Perfect Handle wood handled open end wrench. 299. 9” H. D. Smith Perfect Handle wood handled open end wrench. 300. 10” H. D. Smith Perfect Handle wood handled open end wrench. 301. “K” early Maxwell Auto hubcap wrench, 12.5”. 302. Lot of three Maxwell Auto flat steel wrenches: two No. 3’s and one No. 4. 303. Winchester wrench store display board complete with 32 Winchester wrenches (all four digit series). 304 thru ???. 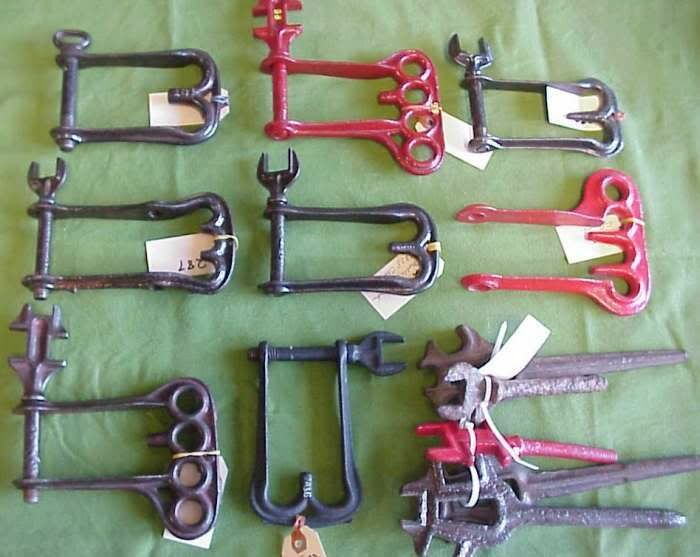 Several hundred collectible wrenches to be sold in choice box lots.